My friend and I recently purchased some 2×2 rough cut walnut (16” long) that we want to assemble into a herringbone tabletop 35”x 96”. We put the walnut on the table saw to rip off the 4 sides so we have some boards that are of similar size / shape. We haven’t put them through a jointer yet, but that is the next step before eventually running them through the planer and cutting them all to be the same length. In considering the glue up process, my friend and I need advice to reduce movement / protect the table from cracking / splitting over time. Our current plan is to glue up on a plywood substrate but are curious if there are better options to creating a herringbone tabletop that will last a lifetime. We are using Titebond 3 for those that might be curious.. Attached is just a rough layout of what the table will look like. Obviously there’s a lot of extra milling work that needs to be done to ensure these boards are going to fit together perfectly for the glue-up. Well, when you make a solid wood tabletop, it going to move. Trying to prevent it is only going to make it fail worse in a way that will only make it more difficult to repair. The best bet is to assume it will move and plan for it. Gluing it to a substrate won’t stop movement, it will make things move unevenly and probably lead to more cracks. The glue will be stronger than the wood. If there are any crack or splits, it would be in the wood itself. Fairly easy to repair with more glue and clamps. It will probably be weaker than a table made with the wood all going in one direction because there are a lot of end grain joints in the herringbone pattern. Depending on the size of the table, the apron may be all you need for support. Otherwise, if the table is wide, you may need to run stretchers along the zig-zagging, end grain joints on the bottom. Our church had a conference table in hickory made in the same herringbone style you’re suggesting, with a plywood substrate. Within a week, the gaps in the top were pretty egregious. Within a month there was a different conference table. Not sure what happened to the old one, but I can guess. I don’t have any experience doing veneered tops, but there are plenty of folks on here that do. Maybe that would be a better approach? Yes, thank you. I meant to include this in my post, as well. Also, any stretchers/supports running from one apron to another don’t need any fasteners. They’d only be supporting the end grain glue joints. I’d be interested to know if anyone has built a herringbone table and managed not to have issues with gaps? I’ve seen herringbone floors survive quite nicely, but it’s not like you notice the gaps in a large floor that’s over 5’ away from your eyes. Wow, thank you guys for all the input. Reduce the thickness of the herringbone pieces down to veneer thickness and use a stable substrate, would be my recommendation. I’ve never done this, though. Reduce the thickness of the herringbone pieces down to veneer thickness and use a stable substrate, would be my recommendation. I ve never done this, though. Very good idea. Anyone have any info on what the maximum thickness of the veneer might be? Would it be different for different types of wood? 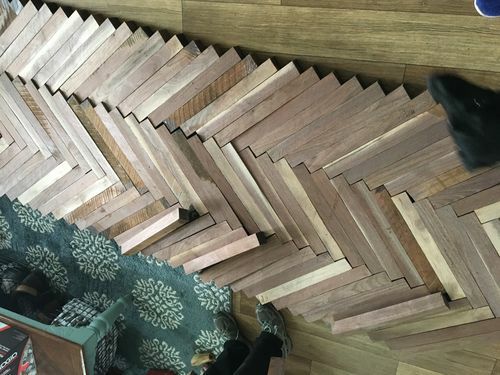 While this might be a good idea for having the walnut herringbone look, I have purchased 120 of these things and am kinda looking for a solid hardwood table. This would of been a great thing BEFORE purchasing all of the wood, and would give a great look I’m sure! Looks like I will probably just build it brick style or like flooring. Seems there isn’t a real solid way to make something herringbone without it failing over time. Thanks for all the input folks!